pistachios, apricots, unsweetened papayas, assorted hard candies (Go Lightly), choc. 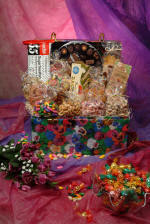 cream chews, caramel popcorn (bag), unsweetened pineapples, 55 Hadar wafers, roasted filberts., dessert dates, Elite choc. bar, herb tea box, baguettes, nacho chips, medium assorted choc. box, jelly bellies. Roasted almonds, roasted/salted cashews, roasted/salted pistachios, apricots, unsweetened papayas, assorted fruit candies (Go Lightly), choc. cream chews, caramel popcorn bag, unsweetened pineapple, choc. hazelnut wafers.